Oregon’s gone from a forgettable team in a state with little homegrown talent to an annual title contender. That’s still pretty cool. The College Football Playoff National Championship pairs an old-money blueblood against a program that really did start from the bottom. Or at least the middle. Not only does Ohio State dominate its head-to-head series against Oregon to an uncomfortable degree, its achievements tower over those of the Ducks. Compare seven claimed national titles to zero, 53 final AP Top 25 rankings to 14, and the No. 1 all-time record against current FBS teams to No. 36. We should appreciate the Buckeyes’ history, one of the sport’s greatest. But the fact that the Ducks are in their second title game in five years gives us something else to appreciate: an elite rising from decades of mediocrity. About what you’d expect, right? 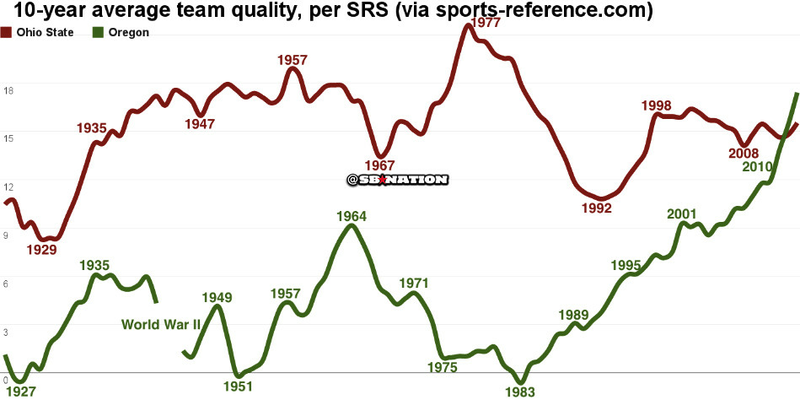 Ohio State is consistently relevant, with a peak decade, 1968-1977, about as good as any program’s. OSU’s line includes two of SRS’ 12 best teams ever, the 1944 and 1973 Buckeyes. And Oregon shot out of nowhere. The Ducks spent three different spans of 10 or more years as a below average team, as recently as 1974-1983. From 1917 to 1983, Oregon averaged an SRS of 2.95. In 2014, Cal went 5-7 and had an SRS of 3.02. Thus, Oregon was pretty much 2014 Cal for almost seven decades. The transformation began in 1977, when the Ducks gave longtime West Coast assistant Rich Brooks his first head coaching job. Brooks beat Oregon State enough to stick — after the previous two coaches had been around for a total of five years — and then started actually winning. In the 1994 season, the Ducks reached their first Rose Bowl since 1957’s loss to Ohio State. Brooks left in 1995 for the St. Louis Rams, and the job fell to offensive coordinator Mike Bellotti. Around this time, Nike co-founder and UO alumnus Phil Knight began donating heavily to the school. Both are important. Bellotti posted four 10-win seasons in 14 years, including a long-unthinkable No. 2 finish in 2001, led by Portland native Joey Harrington at quarterback. Bellotti stepped down in 2008, and again the job went to the offensive coordinator, former New Hampshire innovator Chip Kelly. The Ducks again ascended, with four BCS bowl trips before Kelly left for the Philadelphia Eagles. The job again went to the offensive coordinator, Mark Helfrich, continuing Oregon’s 36-year run of coaching stability. It had been Helfrich who’d fought to offer three-star Hawaii quarterback Marcus Mariota a scholarship early. Knight has given hundreds of millions of dollars to athletic and academic projects around the school, including tens of millions toward Autzen Stadium and at least $68 million for the school’s ridiculous football building. That’s a lot of money, which keeps coaches around, and a lot of facility upgrades, which help steal recruits from longer-established programs. Every big program has rich boosters. But nobody can match the branding advantage Nike gives Oregon. That different-uniforms-every-week thing has helped make the Ducks a national name. That also helps recruiting, as Oregon has to go well beyond its state borders in order to find elite players. There hasn’t been a first-time champion since Florida in 1996. During the BCS’ 16-year run, Virginia Tech in 1999 and Oregon in 2010 were the only championship-free programs to even reach the title game. Whether Oregon wins its first this year or not, it’s accomplished something. Unless you’re the Miami Hurricanes in the 1980s, it takes decades to become a somebody in a sport as old as college football.